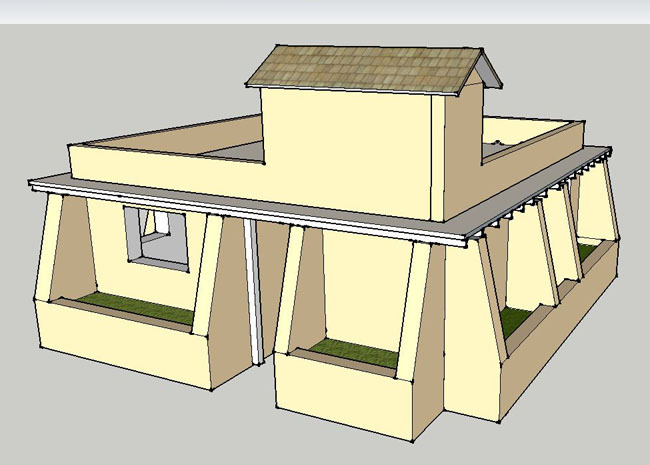 I have been consulting with Mike Parker who started www.childrenofthedump.org in Puerto Vallarta, Mexico about how to build inexpensive, ecological housing for poor families who subsist off recycling materials from the city dump. They typically live in shacks and shanties that are often not adequate for their needs, nor do they provide proper housing for children who then are not able to get an adequate education to better themselves. Puerto Vallarta is on the Pacific coast in the tropical zone of central Mexico, where the climate is generally quite hot and humid. These folks cannot afford air conditioning, so they need shelter that will help moderate the extreme heat naturally. Mike and I have discussed a variety of ways to accomplish this and the design that we came up with should perform quite well in this regard. 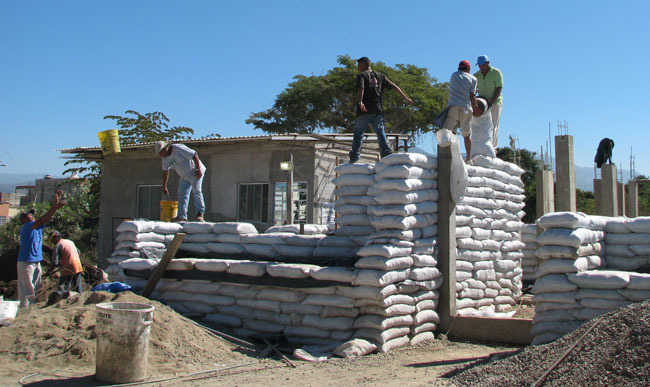 We are using large earthbags filled with adobe soil that provides both insulation and thermal mass. We are berming most of the structure about a meter high with substantial planter beds. We are insulating the roof with large bags of recycled styrofoam. We provide plenty of ventilation via screened openable windows, a central corridor straight through the house from door to door, and there is an openable stairwell to the roof/second floor. We exclude nearly all of the direct sunlight into the house with large overhangs and buttresses. And the breathable interior walls will help moderate the humidity as well. I think that this model home could serve most any place with a hot, humid climate. 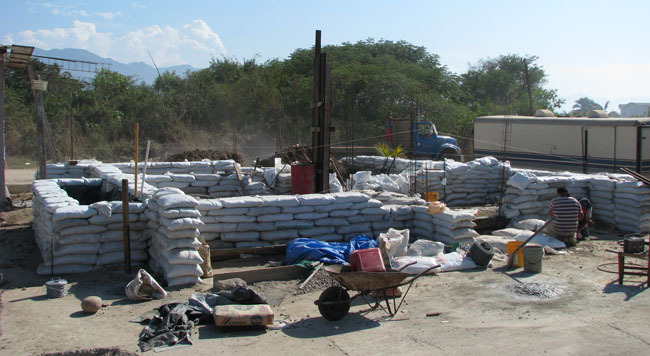 Before I arrived in Puerto Vallarta (in January, 2011), Mike and the workers had already prepared the land, laid out the walls, dug the rubble trench foundation with a French drain, laid down three courses of bags full of gravel, and started laying the walls with adobe-filled bags. Most the polypropylene earthbags employed were recycled from nearby bakeries. As with most bags used in Mexico, they were larger than is absolutely necessary for earthbag construction, measuring about 22″ X 39″. The people from the dump community had been saving bags gleaned from the trash for use in their own homes, and these are also mostly the larger ones. This fact means that once the bags are filled with damp adobe soil, they are very heavy, generally requiring two strong people to move them and place them on a wall. I showed them how they can be filled in place, using a bottomless bucket as a funnel and a metal slider to keep them from getting stuck on the barbed wire. Earthquakes are not common in the Puerto Vallarta area, but they can happen, so there is always the concern of building structurally reinforced building that could withstand shaking. 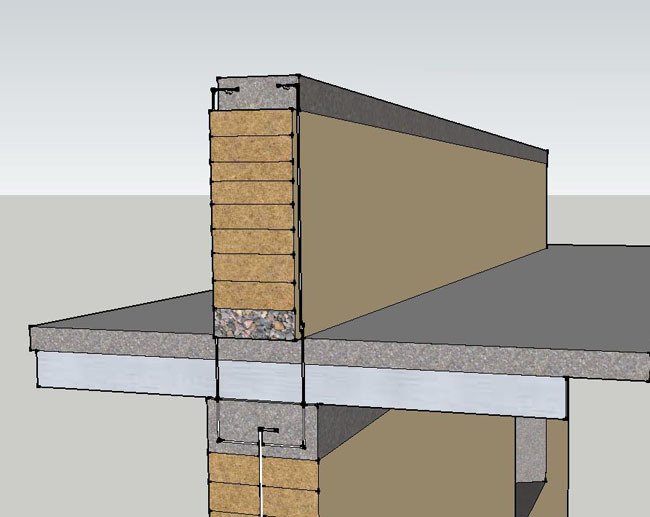 Standard Mexican construction takes this into consideration, using confined masonry techniques with steel-reinforced columns and bond beams that frame the common brick or concrete block construction. Mexican laborers are entirely accustomed to building this way, so this what we decided to use in framing doors and windows and creating a bond beam. I came up with the above diagram, which shows exactly how to construct the walls, bond beams, roof rafters, roof/second floor platform, and the parapet/second story walls. Basically what this has created is a design for a reinforced two-story earthbag building that might pass code standards for most seismic zones around the world, although I cannot guarantee this. In this particular building, the lower story walls are not reinforced the way they would be according to the specs provided by Precision Engineering, but those walls are heavily buttressed and have been reinforced with periodic vertical rebar, and tied at the bond beam with steel rafters/joists. They also have the barbed wire and the plaster wire mesh as specified. This will be a very solid building that should withstand most forces it will likely encounter during its life. For more photos and description of this entire project see this page.